The majority of people living in the world today don’t know the first thing about thriving. We know a lot about surviving, and are pretty darn resourceful about just getting by. But thriving doesn’t appear to be much of a priority, or even a realistic goal. Most of us just don’t have any energy left over for anything beyond fulfilling the current demands we have, and getting through the next day. We are all just so busy, and we don’t have any extra time available to contemplate what a better life might even look like. Perhaps you quite logically thought that a new partner, a bigger house, a fancier car or a different job would fix everything. But that didn’t work out so well either, and now even after making all of those changes, you’re still feeling all the same disappointment, frustration, or even despair that you were feeling before. Even if your life is a total mess right now, you cannot see a way out and you are sure that you completely missed the memo on how to create a thriving life, I can assure you there is hope. There are different questions you can ask and different choices you can make. That’s what my book and this website is all about. I’m Mary Anne Dorward. Professionally, I had a career as an accomplished actress on Broadway and TV, then as a wildly successful and transformative public speaking coach, and then as a communication strategist and speechwriter for politics as well as being a parent of two great kids. For a time, it was all very glamorous: I was traveling around the world, working with interesting and influential people, and making lots and lots of money. By the world’s standards, I was the epitome of an internationally successful woman, and I should have been the happiest person on earth. But something was clearly wrong. I had followed all the rules, and yet had not ended up with all the goodies of joy and happiness that I thought would be the big reward, the payoff I was sure was waiting for me at the end of all that relentless work. The payoff certainly wasn’t the five cancers, the two near fatal accidents, the divorce, the overwhelming despair and all the other obstacles that had also come my way. Had I taken a wrong turn somewhere along the way? Somewhere deep within, a still small voice kept telling me there had to be a better way to live my life. Perhaps there was a different definition of success and maybe, even different rules that went along with it. All I knew was that if I was going to survive, somehow I had to discover something to truly live for. I set out in search of an answer to that question. 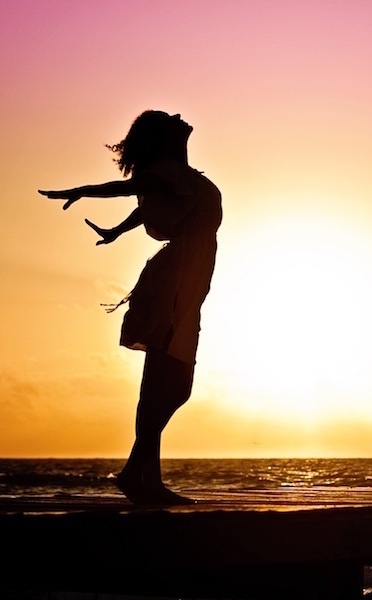 I tried different approaches to find both healing and authentic happiness. I went all around the world to meet healers and shamans and spent hours in meditation and in therapists offices in self inquiry. That’s one of the great things about survival mode and standing at death’s door: you are open and willing to try anything. Eventually, as I moved out of pure survival mode, and then into my many trips circling around what I call The Roundabout, where I tried even more different approaches, I finally discovered 11 keys that helped me create a truly thriving life and ignited what I call my Thrive Drive. Many people couldn’t believe that I survived all the challenges I faced, and wanted to know how I did it. 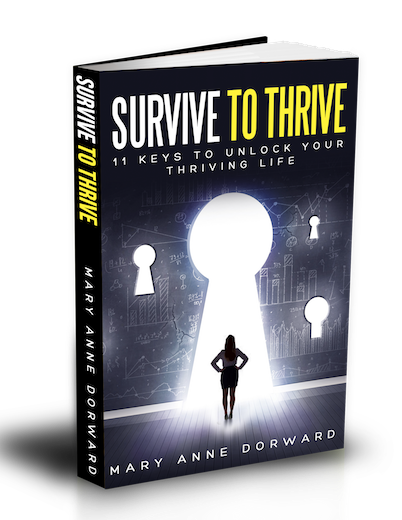 So, I wrote this book, Survive To Thrive: 11 Keys To Unlock Your Thriving Life. 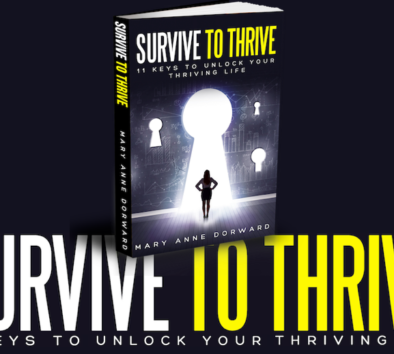 Survive To Thrive is a roadmap, which will help guide you toward your own thriving life. In this book, I don’t tell you how to live your life, but I do give you examples from mine which will help you choose your own route toward your thriving life. To help assist you in your process of radical change, throughout the book I share ideas and exercises that you can take for a test-drive in your own life. The choice to change or to continue to suffer in the pity pit is entirely up to you. However, by the time you’re done reading this book, I believe that you will be inspired to take new action in many different and innovative ways you hadn’t dreamed possible before. I invite you to join me for what may be the most transformative journey of your life: discovering and revealing the you which has always been inside, just waiting to speak with your true, authentic and real voice. The book is your first stepping-stone to help you design and launch your unique version of a thriving life. But thriving is not a destination; it is a continuous journey of discovery and self-examination. 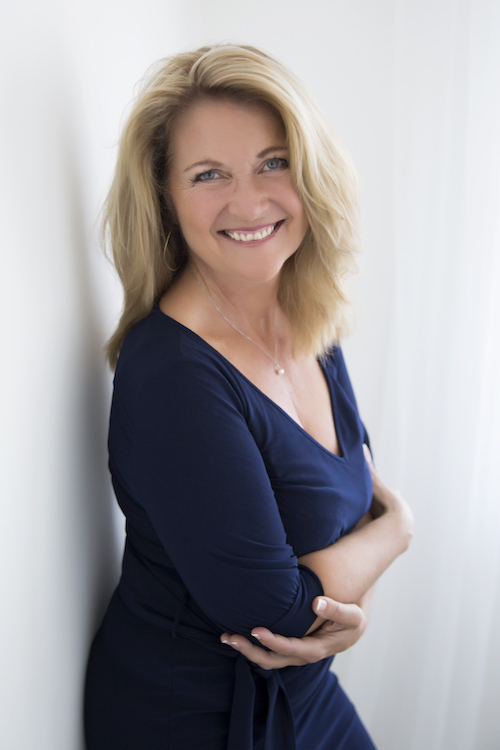 After reading Survive To Thrive: 11 Keys To Unlock Your Thriving Life (Click here to join the list to be notified when it’s available), you may recognize the need for an even more personal exploration. Here at the Words To Thrive By website, you can continue your journey to thriving with other like-minded people such as yourself. You will also find lots of great free resources here to help you gain a deeper understanding of yourself and your personal goals. Welcome to The Thrive Tribe. Check out some of my newest and most popular articles below. And click here to become an official member of the Thrive Tribe.